With the new ruggedly-built AMS HIGH SECURITY OUTSIDER Combo Machine, you can vend products in places that are prone to breakins or even outside. For instance, the AMS Outsider Combo Machine can be placed in parks, rest areas, swimming pools, car washes, baseball fields, and schools. Now, there are unlimited numbers of locations that you can sell drinks and snacks in. Available in snack, all drink, and snack-drink combo. The AMS Combo vending machine has 10 selections of chip-pastry, 10 selections of candy-cracker and 16 selections of drinks. The machine is very simple and user friendly. AMS backs their machines up by having the best combo warranty 3 years on parts except fluorescent bulbs, glass and paint finish. Shipping not included. The High-Security-Outsider comes with a high security lock cover. It has triple-pane heated glass protected by a layer of clear Lexan. This machine is designed to service small to large locations. There is an energy saving feature “Energy Sensit” built into every AMS machine. This saves energy thus saving money. Available in bright red or black. Our telephone technical support and parts team will be happy to assist you with any issue you may have. Monday – Friday 8am – 5pm EST for as long as you own the machine. 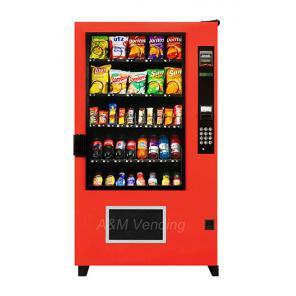 We also sell outside drink machines such as the Vendo 721 Drink Machine .